I love to cook as much as I love to eat. As I am busy pouring over interior design for my new home, I also started dreaming about the entire different cooking utensils which I wish to own in my future kitchen. One of the item from the list is the dutch-oven / cast iron pot. Previously, I dare not look at these pots because it is usually so expensive and not owning my own kitchen will means that my precious pot might be not used as carefully as I want. Now that I am planning for my own kitchen, how can I not look?! And so, begin the journey of my research on these amazing pots. However, I did notice that Le Crueset is much more raved about in the USA. Perhaps it is because most of their celebrity chef uses Le Crueset. Initially, I was planning on getting the Le Crueset as this is the only brand I can find in Malaysia. But, the price seems a little too high for me. The 27cm oval would probably cost you about RM 1,100 – 1,200 (USD 365 – USD 400). As for Staub, I didn’t manage to find it anywhere. Sigh… So, I couldn’t compare the price. The nearest place to get Staub would be in Singapore!!! and even then, prices are about SGD 350 – 400). But, I was told by a good friend that sometimes during sales, you can get a good price of SGD 150 for the pot. 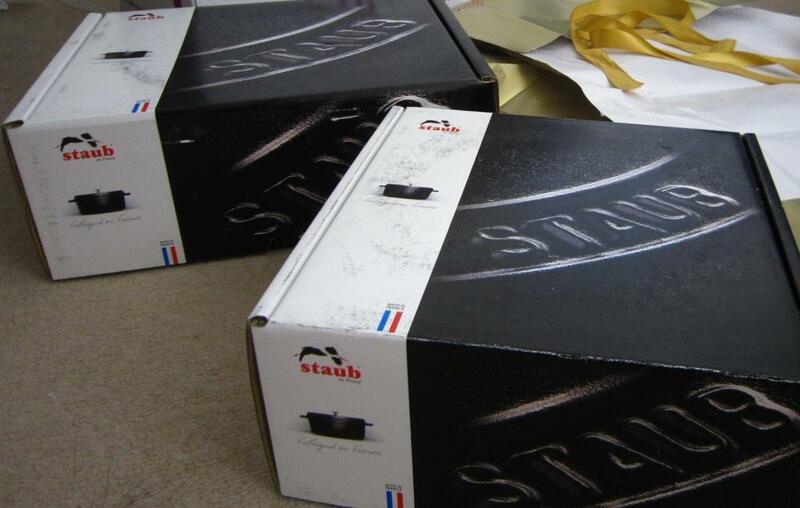 Personally, I preferred Staub because Paul Bocuse endorses it !!! And several of my favorite restaurants in France uses it too. In the end, I decided that the main factor which will dictate my decision would be the price. Now begin my journey of hunting for a good bargain. Finally, I manage to find this online site in Sydney which offers really good deal for the Staub pot. Without hesitating, I bought 2 of them!!! I got the 31cm Oval and 24cm Round for a total of AUD 247 (approx. RM 770) courier to Melbourne (since I am heading there anyway – and also because the site only deliver within Australia). I am now a proud new owner of 2 Staub pots. Love the colors too – Pesto.